Back in the 90’s, MTV was much more experimental with their television programming. It was before reality shows contaminated MTV. It was a time when risky, original ideas could flourish on the network like Aeon Flux, Celebrity Deathmatch, Beavis and Butthead, Liquid Television, Cartoon Sushi and many other shows. One of those shows was a late nighty raunchy sock puppet show called “The Sifl and Olly Show”, which was created by Liam Lynch and Matt Crocco. The Sifl and Olly Show aired on MTV from 1997 to 1999 for two seasons. A third season was produced, but it never aired on television. The show was about a green sock puppet named Sifl and a white sock puppet named Olly who would conduct interviews, take calls from the public, run their own version of the Home Shopping Network, and break out into crazy songs. They used catchphrases like “crescent fresh” and the humor typically involved profanity, sexual references, and drug innuendo. Another big fan of Sifl and Olly was Aaron McGruder, who created “The Boondocks” comic strip and the animated series. The kids in this April 28, 2000 “The Boondocks” comic strip display their sadness over the cancellation of “The Sifl and Olly Show”. During an episode of The Boondocks animated series on Adult swim, Huey talks about how disgusting it is to wash prostitute laundry (Skip to At 14:20 – 14:32) which is another big reference to The Sifl and Olly Show. 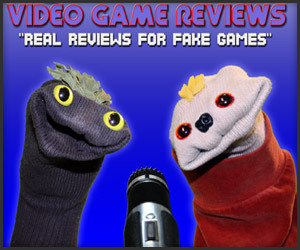 The Sifl and Olly Show returns as a gaming review show for fake games. We would like to thank Liam Lynch and Machinima for giving us an opportunity to ask a few questions. Can you describe in detail how the idea of rebooting Sifl & Olly into a gaming oriented show came about? Did Machinima approach you, or did you approach Machinima? How long were discussions going on about rebooting the show, and were there any legal issues with MTV/Viacom owning the rights to the previous show? Well, I approached Machinima because I thought it would be a good place that was accessible to anyone and had a huge audience, without being a TV network. I own Sifl and Olly as characters. They reverted back to me 3 years after they went off the air. MTV owns their episodes because they paid for them and paid me to make them… but I own Sifl and Ollyand can do whatever I want with the characters. So there wasn’t any discussion with MTV because they have nothing to do with Sifl and Olly now. I don’t really like or trust any networks right now and TV is in an exciting fluid state where the internet is trying to be TV and TV is trying to be the internet. There’s no solid ground and the living room isn’t where a lot of watching occurs anymore… it’s on ipads, in cars, on phones, at work, on computers… it’s so many different places that I wanted access to all those places and YouTube does that. The premise of the new show is about Sifl & Olly reviewing fake games that don’t exist. Are any of these fake games going to be spoofs/satires of currently existing games? Yes, there are a mix of things. So some episodes are games just based on nothing at all and totally random, while a few other episodes are obvious spoofs. Spoofs are made to be funny whether you’ve seen the game it’s spoofing or not. Of course gamers will get some of the jokes or things being poked fun of but since the games aren’t REAL… gamers and non-gamers can view them equally. The Sifl & Olly Show ended in 1999. It’s been over 10 years since many people saw them. There’s an entire new generation of people out there who have never been exposed to Sifl & Olly. Do you see any challenges in creating a show that appeals to the fans of the MTV show while also appealing to the sense of humor of gamers who may not have seen the MTV show? You know, over time I’ve come to realize that it just doesn’t matter. Nothing matters. I never really care what people think. Everyone has their own taste. All you can do is have the guts to put something out there and people will throw either rocks or roses at it. I think I’ll please and anger some Sifl and Olly fans and I’ll please and anger some gamers that never heard of them. haha. These episodes are a good balance of things,though. It’s Sifl and Olly, so fans of the show will be stoked they’re watching new Sifl and Olly episodes on their iPad in HD… but gamers will have fun because it’s a weird twist on the video game review videos that can get boring and repetitious. I really just made things I wanted to make, that I thought would be fun and that’s how the original show was too. It’s the same spirit. The Sifl & Olly Show was always pretty low budget compared to other television shows. Is there much of a difference in budget per episode on Machinima compared to doing episodes on MTV? The budget on these Machinima episodes was far below what Sifl and Olly had on MTV, however, there is no crew or assistants or anyone involved. You’ll find these Machinima episodes to look as if the budget was 5x more than the MTV shows. The production value is much higher but I did everything myself with no one else involved besides Matt doing his voice parts. Technology has obviously come so far in the last ten years. The graphics on the show are still fun and feel very Sifl and Olly but have joined the modern age. Sifl and Olly episodes have always incorporated 3D animation into the videos and songs and scenes, so it’s fun to do that now but raise the bar a bit. Can we expect segments from the MTV show like Interviews, Calls to the Public, S&O News, or Precious Roy’s Home Shopping Network to return for your new Machinima show? And can we expect any returning segments to be more gaming related? Well, in these first 8 there are a variety of different types of things going on… we do a segment called “Calls From The Gamers” but no repeats of the show’s previous segments. These aren’t half hour episodes like the TV show but you could easily see these Game Reviews as one of those repeating segments, like S&O news or something. They’re certainly longer than those segments, some were 30 seconds or 1 minute… but these are all new. This is just a first step in bringing Sifl and Olly back to people though. This is a fun way to do it. Who knows, in time there could be half hour episodes again and we could bring back some of the old segments. Do you and Matt Crocco regularly play games? What are some of your favorite video games (past and present) and what game consoles do you own at the moment? I play video games almost every day. I play Xbox 360. Matt doesn’t play video games at all. He might have when he was younger but he isn’t a “gamer”. He doesn’t have a console or anything. This holds true to the new episodes too… Olly is a gamer and wants to talk games but Sifl doesn’t know or care about games at all. This is also good for those folks that aren’t gamers. They side with Sifl since he’s not a gamer and thinks a lot of it is nerdy and ridiculous. Some of my favorite games include Red Dead Redemption (because it’s actually relaxing and the nature system is absolutely amazingly real and beautiful. The game is so highly re-playable.) I love FallOut, I love all the Elder Scrolls series, I loved Max Payne 3, I also loved Bioshock… Psychonauts…the first two Mass Effects… Portal… ugh… there are so many I love. I’ve been playing games constantly since the first Atari. A fond gaming experience of the past was actually Earth Worm Jim on Sega. I loved that game. It had so much humor, amazing music and innovative claymation/type graphics for its time. Such a fun game. Aaron McGruder, creator of The Boondocks, is a fan of your show. He’s even referenced Sifl & Olly in his comic strips. Are you a fan of The Boondocks (comics or the animated series)? Yeah, I heard that before. It’s really cool. I think he was one of the first (and few) people to ever reference Sifl and Olly. I’ve seen the boondocks before but haven’t watched the animated series. That’s certainly crescent fresh of him though. You went on to direct movies like “Tenacious D in the Pick of Destiny” and “Sarah Silverman: Jesus is Magic”. Then you went on to direct music videos and work with bands like Foo Fighters, No Doubt, Queens of the Stone Age, etc. Does it feel strange to go back to making a show about sock puppets after directing more complicated feature films and big music videos? No, not really. It sounds dumb but I just like making stuff… I don’t care what it is. It’s just fun being creative. Some of the things I did in these Sifl and Olly episodes were more complicated than my work on those things you mentioned. There are some more challenging shots involved in future episodes than what have been in the old Sifl and Olly shows. The same thought processes and work have to go into things no matter if it’s socks or Queens of the Stone Age, hahaha. It’s all just being creative and making decisions and then seeing them through.